1952 West Virginia inspection sticker - $20.00 : Bob Hoyts Classic Inspection Stickers, Add a Final Touch to your Restoration! 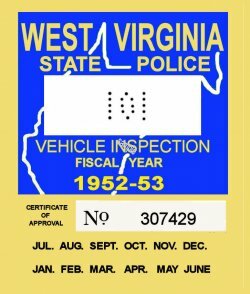 This 1952-53 WV inspection sticker was created from an old nearly illegible original. We are looking for any stickers we do not show here or photos to correct any that we do have. For an additional $10.00 buyer can add license plate number to this sticker.